Welcome to lesson 8 of the homemade how-to series: how to cook dried beans. In each lesson, I break down the steps for a home cooking skill I searched for often as I first learned to cook, or one that’s always been on my to-learn list. A recipe to showcase your new skill will follow a couple days after the how-to post! Chances are, you searched for this tutorial in a pinch, so let’s dive right in! Click here to jump down and read more about cooking dried beans and some ideas for how to use them. Put beans in a large mixing bowl and fill almost to the top with room temperature or cold water. You should use at least three times the quantity of water as beans. 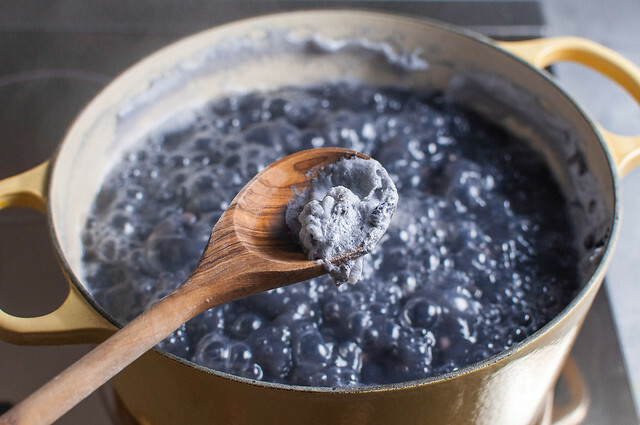 Leave beans to soak at room temperature for six to 24 hours. If you have a very hot kitchen (above 80 F), you can place the bowl in the refrigerator. 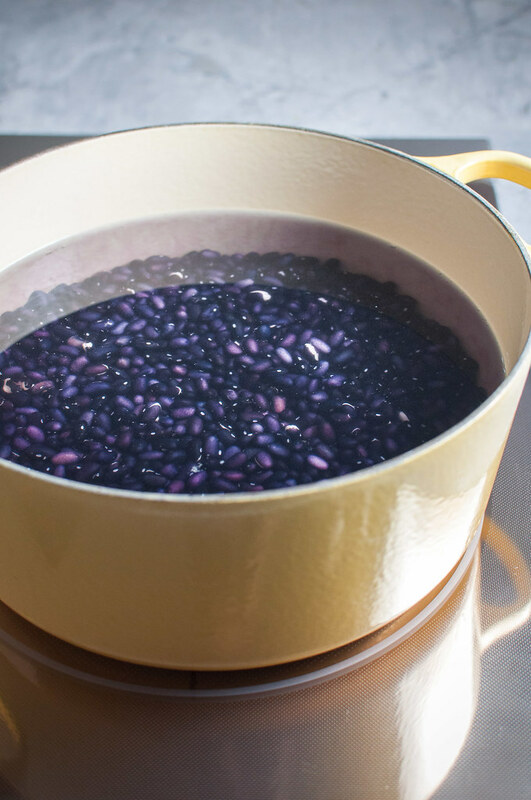 After 12 hours, drain the beans and fill the bowl with fresh, clean water. Drain beans and rinse in a colander. Transfer beans to a large pot. Cover the beans by about two inches with water. If you add more than that, it will take unnecessarily long for your water to boil. Do NOT salt. Bring the water to a vigorous boil over high heat. 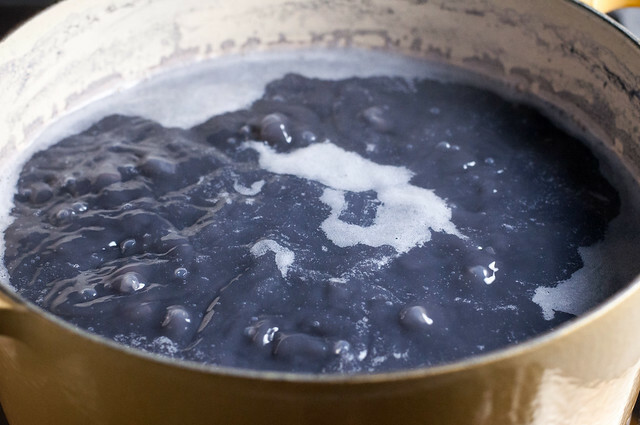 To accelerate boiling, cover the pot, but check on it frequently so it doesn’t boil over. Continue boiling vigorously for 5 to 10 minutes, uncovered. If a lot of “dirty” looking foam forms on the surface of the water, you can skim it off with a wooden spoon. The foam comes from proteins in the beans but it doesn’t negatively impact the flavor, so it’s up to you. Reduce heat so the beans simmer gently. Simmer, uncovered, for 15 minutes. Add 1 teaspoon salt for each cup of dried beans you started with. 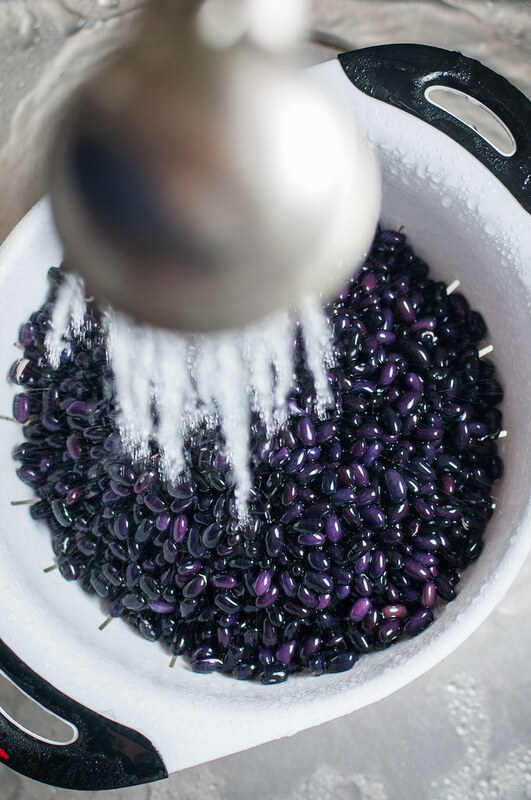 It’s important not to add salt until later because, if added to the pot early on, it draws moisture out of the beans, detracting from the texture. Continue simmering beans until tender but few to none of the skins have broken. This can vary widely: I set the timer to stir and taste the beans every 10 minutes or so. While many recipes for cooking beans call for lengthy cook times, I rarely have to cook conventional varieties of beans for more than 35 minutes when soaked overnight. Shorter soaking times will usually lead to longer cooking times, but this isn’t always the case. Remove beans from heat and drain into a colander. Rinse with cold water to stop cooking. Serve alone with seasoning to taste, use in desired recipe, refrigerate for a week, or pack and freeze in smaller quantities for months. 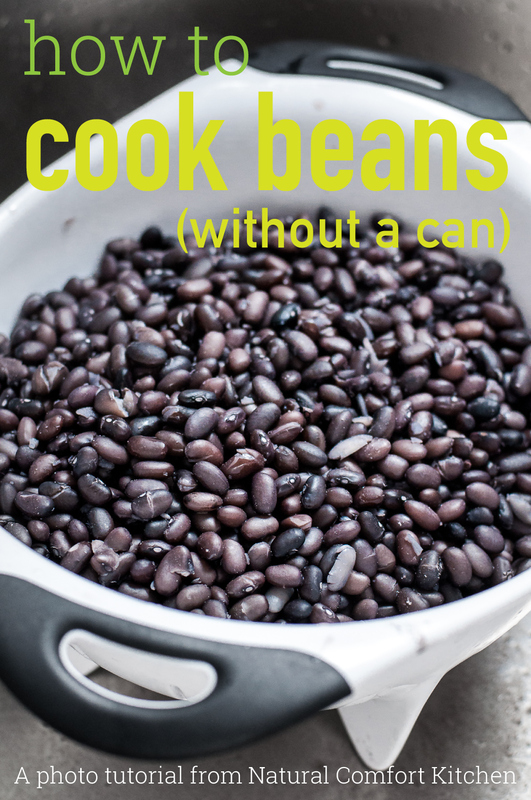 There are so many reasons to ditch the can and cook dried beans yourself at home. 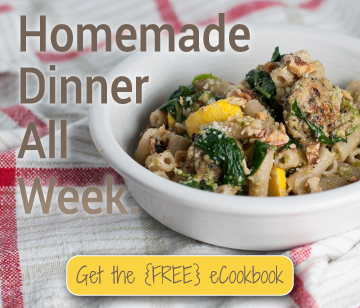 Give it a try to see how easy, tasty, and economical homemade beans can be. To show the recipe as a list of numbered steps, click the "Print" button in the upper right! Bring the water to a vigorous boil over high heat. 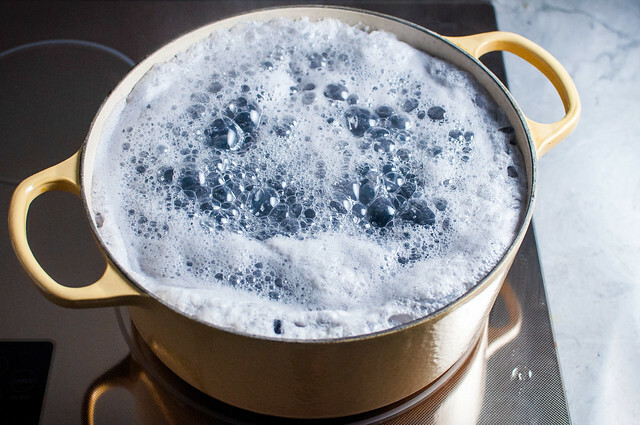 To accelerate boiling, cover the pot, but check on it frequently so it doesn't boil over. Continue boiling vigorously for 5 to 10 minutes, uncovered. Optional: If a lot of "dirty" looking foam forms on the surface of the water, you can skim it off with a wooden spoon. The foam comes from proteins in the beans but it doesn't negatively impact the flavor, so it's up to you. Optional: Add 1 teaspoon salt for each cup of dried beans you started with. 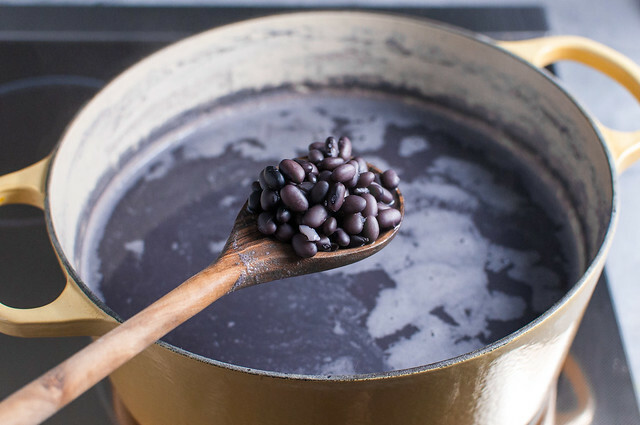 It's important not to add salt until later because, if added to the pot early on, it draws moisture out of the beans, detracting from the texture. Continue simmering beans until tender but few to none of the skins have broken. This can vary widely: I set the timer to stir and taste the beans every 10 minutes or so. While many recipes for cooking beans call for lengthy cook times, I rarely have to cook conventional varieties of beans for more than 35 minutes when soaked overnight. Shorter soaking times will usually lead to longer cooking times, but this isn't always the case. Prep (soak) and cook times will vary depending on the specific beans and their freshness. Garlic quinoa buffalo bean bowls are a fun way to put your cooked beans to good use! 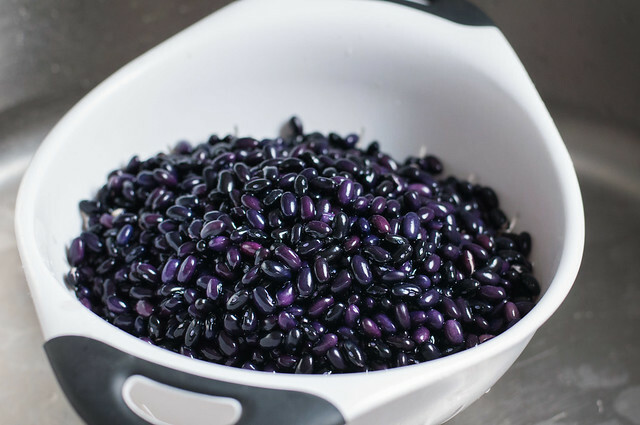 Down below there are some specific ideas for what to make with beans, if you want to get fancier than a simple bean salad or rice bowl, which are two great, easy ideas. You might not have thought about eating beans for breakfast, especially given their, um, flatulent qualities. However, if your tummy can get used to it, they’re a great way to get FULL and get some vegan protein first thing in the morning. 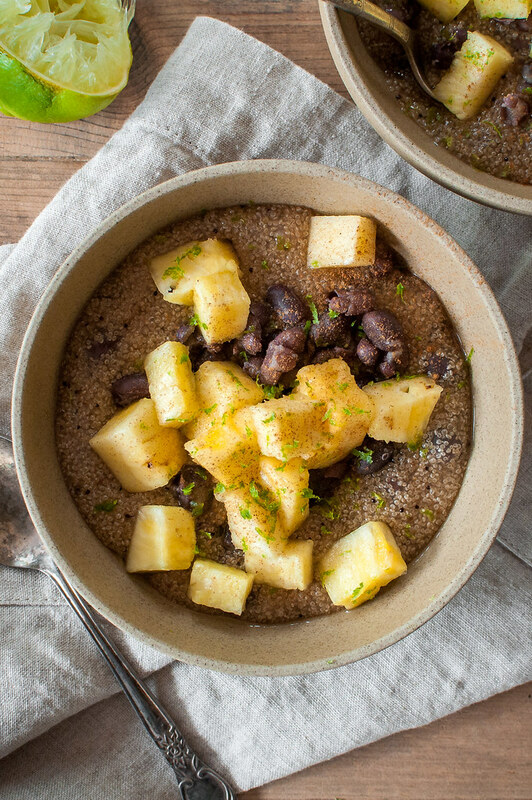 The recipe for the tropical amaranth and beans breakfast bowl will be on the blog shortly! A better title for this how-to might be, “How I Cook Dried Beans”. While cooking dried beans is seemingly straightforward, there are lots of slight variations, often regarding the soaking time for dried beans. Today we’re breaking down how to cook dried beans the most traditional way, with a full soak, then boiling on the stovetop. Despite quick-soak options and crockpot and pressure cooker methods out there, I still use the “long” version every time I make beans. It’s easy to remember, doesn’t require exact ratios of liquid to beans, and I often have plenty of other stuff to do in the kitchen that hanging out for 15 to 90 minutes is no problem. I can cut up bananas for smoothies, get breakfasts ready for the week, or make a pot of homemade stock on the next burner, if I’m feeling really motivated. Another benefit? When I remember to save it, stovetop cooking yields wonderfully flavored bean broth that’s easy to freeze and ready to make your soups and chili at least ten times better than with store bought stock. But, of course, there’s the question of why cook your own beans when you can just buy them, organic and salt free, in a can? You’ll actually find several cans of beans in my pantry at any given time, and they’re perfect for a quick salad or weeknight curry. But if you happen to eat beans almost every day or are serving chili to 20 people, canned beans just aren’t economical, and the packaging gets wasteful. A can of quality beans, 1 1/2 cups, will run you around $2.50, so about $1.64 per cup. A one pound bag of dried beans, on the other hand, costs about $2.00 and sometimes yields 9 cups of cooked beans. That’s $0.22 per cup of cooked beans, compared to $1.64 for a decent brand of canned. Given the amount of beans I’ll consume in my lifetime, I’ll happily take that savings on even half the beans I consume for just a bit of work. Finally, after all those logical and way too mathematical arguments for cooking beans yourself, the most important reason can’t be quantified: TASTE! True, there are better canned beans available all the time, but homemade beans often still taste better. For a real treat, check out the online store at Rancho Gordo, treat yourself to some funky dried beans, and see what I mean. Almost. There are a few types of beans, like the popular spring fava bean, that require special treatment. In the case of favas, you have to remove the outer sheath, in addition to cooking them. If you’re working with a less conventional bean variety, check online or look at any package instructions for indicators of special procedures. Unless you’re having a massive chili cookoff or feeding a very large family, it might seem that cooking beans in such a large batch will leave you eating black beans for two weeks straight. Don’t worry, though! 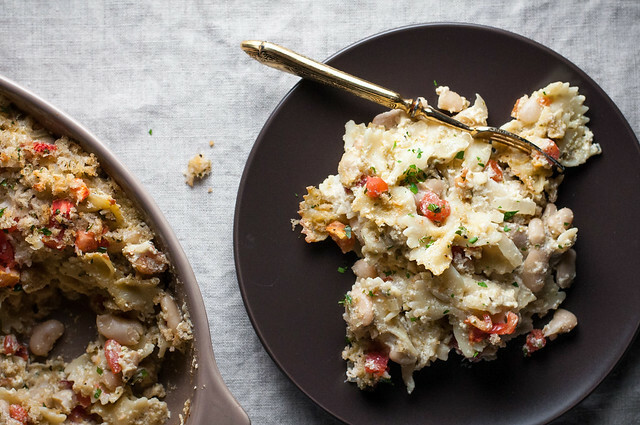 It makes the most sense to cook beans in large batches, but they keep so well made ahead. You can refrigerate them for a week or freeze them for months. I’ve found a great way to freeze beans is to put them in quart-sized freezer bags, in quantities of 1 1/2 or 3 cups (the same portions you would find in a can), then lay the bags flat to freeze. You can pull them out to thaw in just the quantity you need, not 10 cups at a time, some of which will end up going right back in the freezer. Why oh WHY must I soak the beans??? 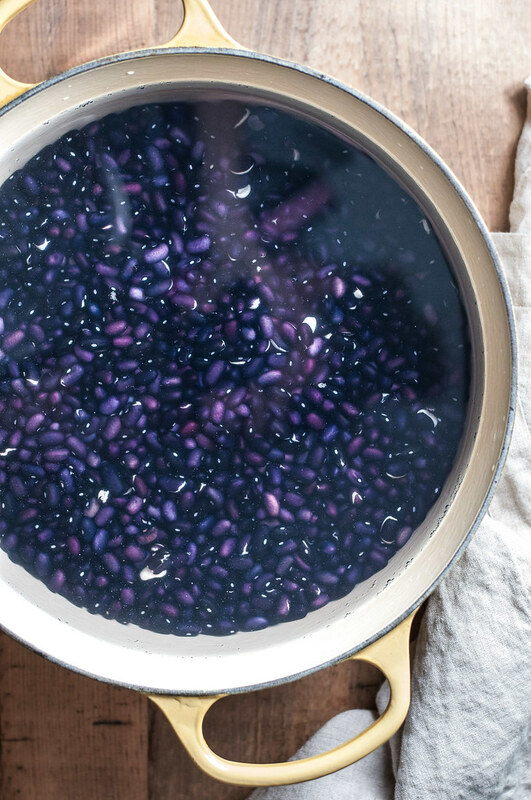 Soaking the beans is not just a ploy to get you to do extra work! 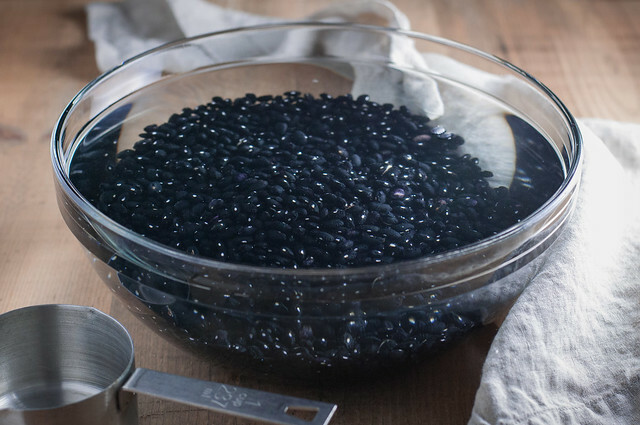 Since you usually don’t know how long your dried beans have been sitting on a shelf or in a bulk bin, you have to assume they are pretty dry, and the initial soak helps reintroduce moisture and uniformly soften the dried beans to an extent. That way, when you do cook them, it’s much easier (and quicker) for them to absorb the boiling water. They cook evenly and much more quickly than they would without a soak. THAT, my friend, is a loaded question. Beans are, in my opinion, the ultimate source of plant-based protein. There are so many varieties and recipes to explore that the possibilities are literally endless. Here’s just a snippet of my all time favorite uses and recipes for beans, the one you’ll find me actually eating on a weekly basis or cooking up for company.